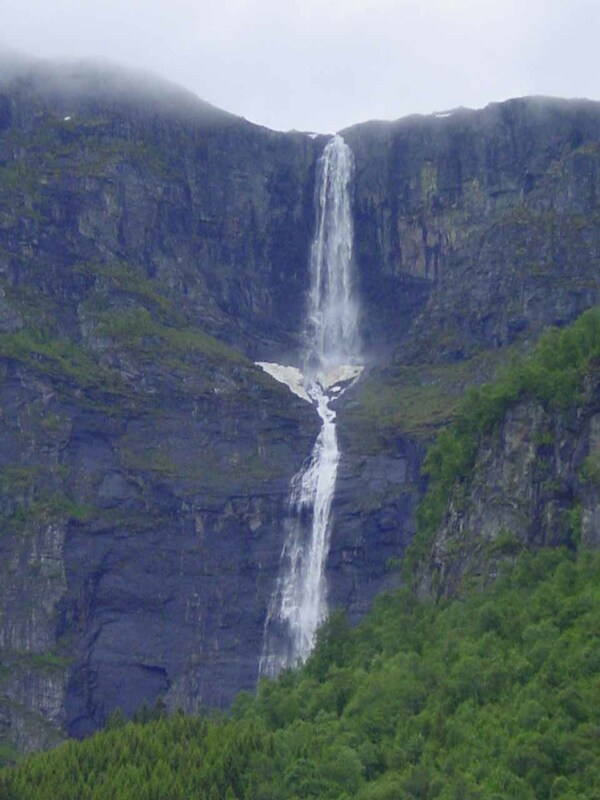 Skrikjofossen and Opofossen were a waterfall pair that made their plunge and tumble from the highlands of the Hardanger Plateau (Hardangervidda) towards the South Fjord (Sørfjorden) by the town of Ullensvang. Actually, it was Skrikjofossen (I’ve also seen it spelled Krikjofossen) that was much more visible during our visit in June 2005. It made a pair of dramatic plunges (said to be as little as 300m high or as much as 455m tall though I think it could very well be taller than that). Thus, we were easily able to see it from the main road by both Ullensvang and the hamlet of Lofthus. However, its lower sections were obstructed by a sloping cliff so it beckoned us to find a way to get closer for a better view (which turned out to be less straightforward than we thought). 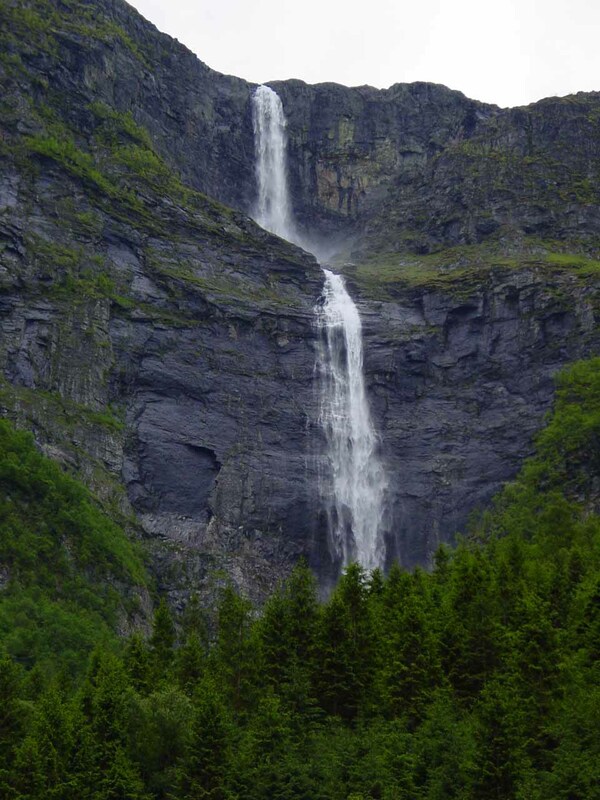 Conversely, the other waterfall was the cascading Opofossen. 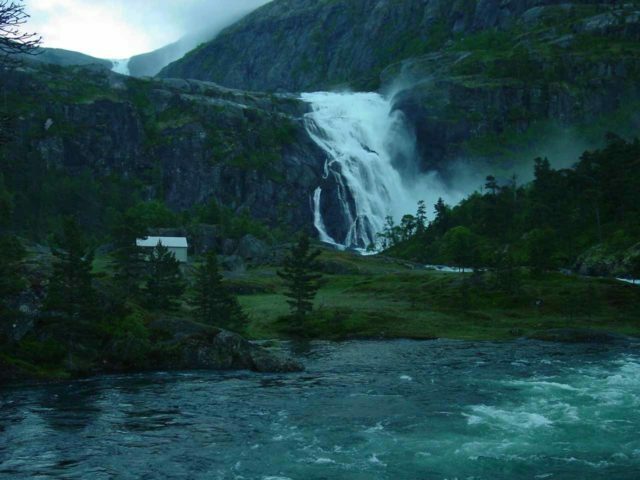 This waterfall was the more forceful and northerly one across from Skrikjofossen. 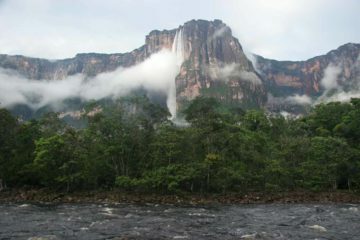 Unfortunately, it was mostly hidden from us as it was mostly facing the other waterfall before finally revealing a small glimpse of itself at its bottommost tiers. The falls (said to be 650m in total height though we had no way of verifying this in the field) was really a series of plunges and cascades. 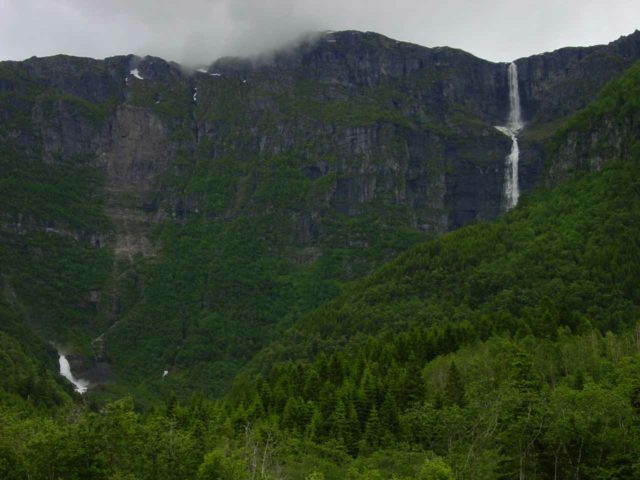 According to Norgeskart, the hidden uppermost tiers was called Rjukande (or Rjukandefossen meaning the “Smoke Falls”) while the barely-visible lowermost drops were called Bjørnabykset (“bear’s leap”). It wouldn’t surprise me if there were many other names or understandings revolving around this overall waterfall series. Regarding our visit to these falls, it might have been a case where there were apparently many ways of experiencing this place though we picked what we thought were the most straightforward ways to see them. 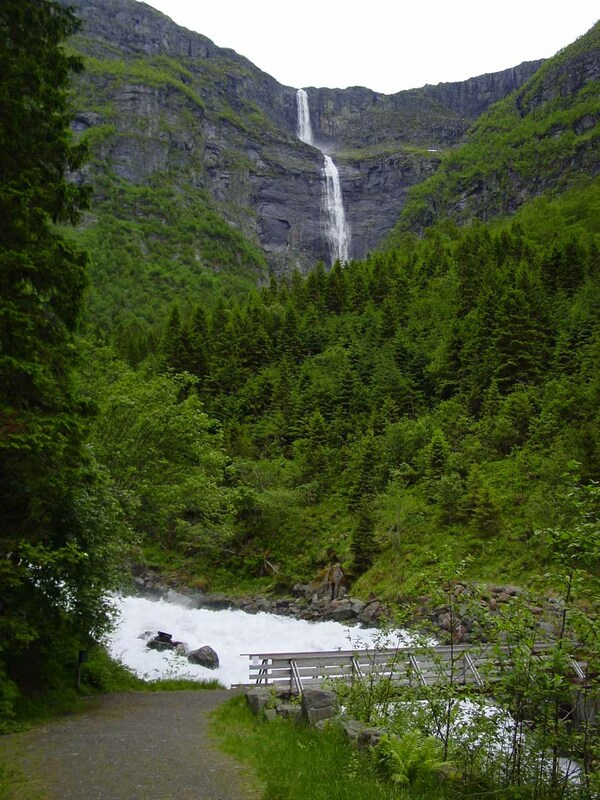 This involved seeing the falls informally from the Rv13 as well as from a somewhat easy hiking trail in Elvedalen, which was the small valley between Lofthus and the cliffs giving rise to the waterfalls. 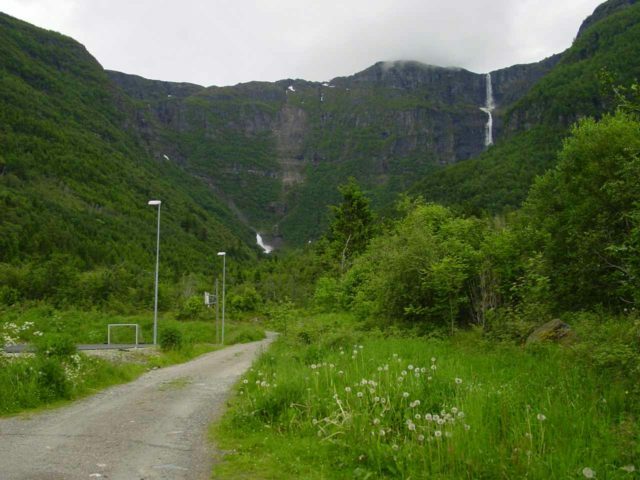 Speaking of this trail, we started our attempt at improving our roadside views from a school in Elvedalen (see directions below). 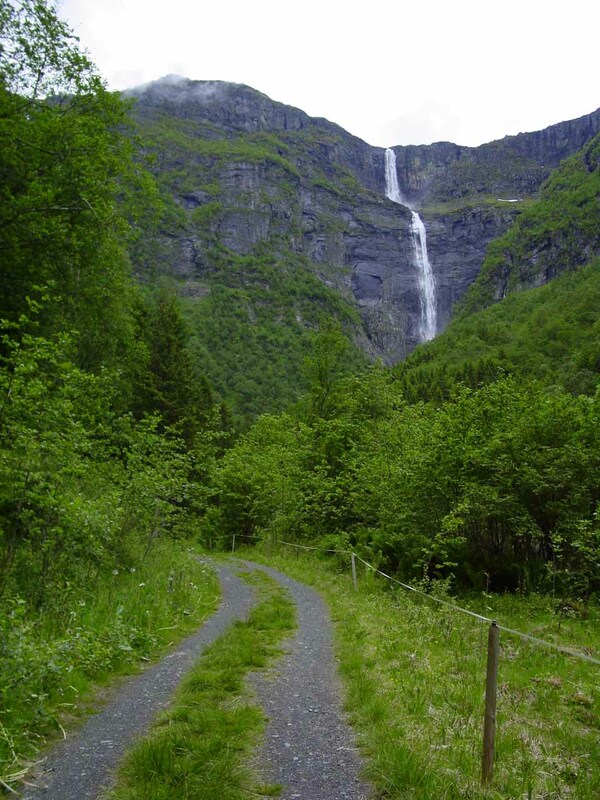 The trail was somewhat easy and straightforward as we passed by the school and walked alongside the northern bank of the Opo River deeper into Elvedalen. According to our rough GPS track marks on our GPS log, we walked about 1.2km in each direction to a bridge that crossed the Opo River. Throughout the walk, we saw that Skrikjofossen’s two main tiers were separating from each other as it appeared more angled to us. 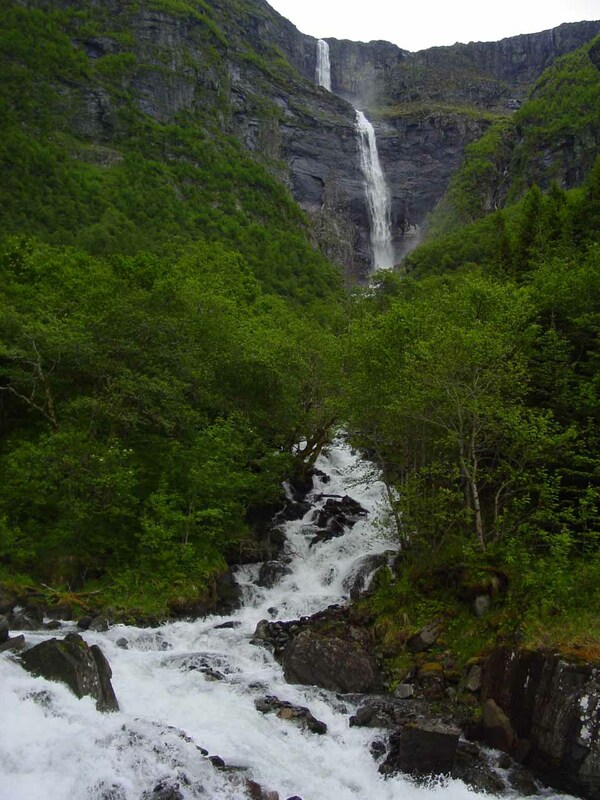 Meanwhile, Opofossen remained frustratingly elusive as the trail didn’t really reveal much more about itself other than some intermediate cascades between the bridge and the lowermost tiers of Bjørnabykset. 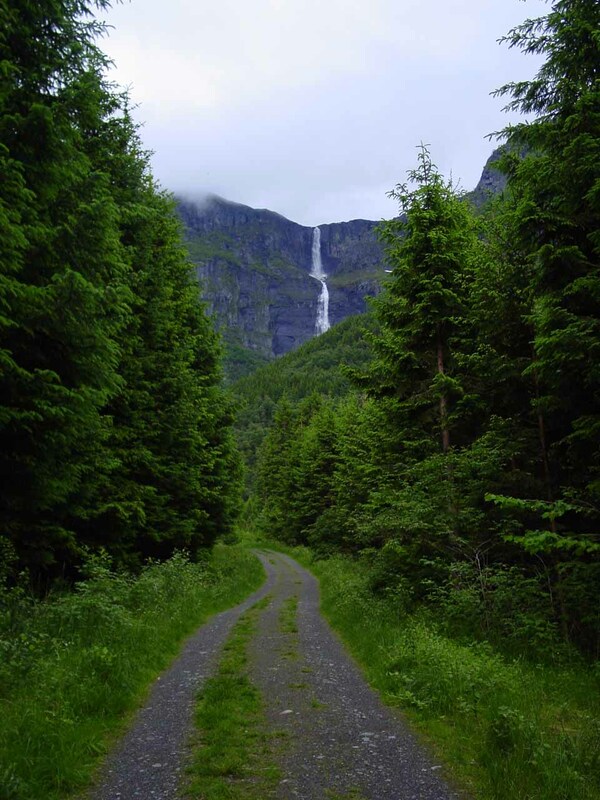 We had found an informal trail that continued scrambling alongside the northern bank of the Opo River hoping it might get us to better views of Opofossen. 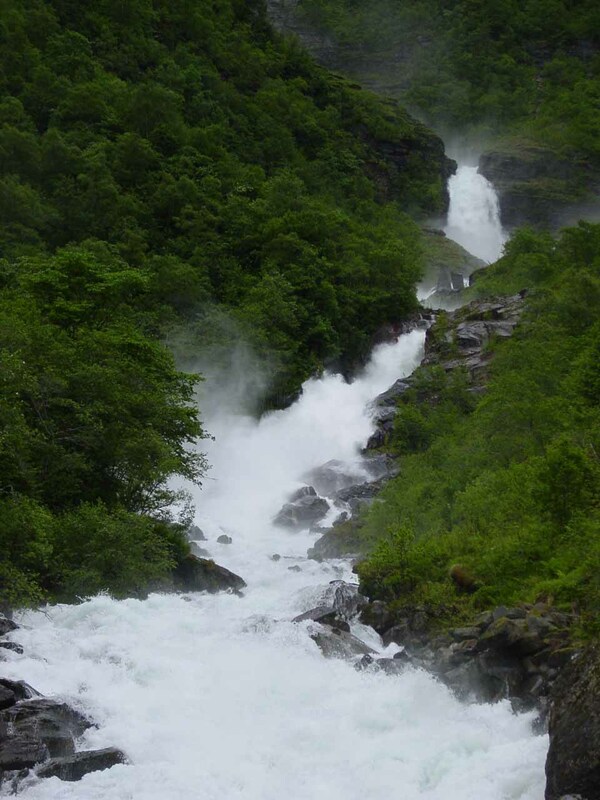 However, it eventually ended with a direct view of the outflow of the creek Skrikjo as well as a slightly more angled view of Skrikjofossen itself. According to our maps, the track on the other side of the bridge only curved back around and followed the southern banks of Opoelva back towards Ullensvang so we decided to turn back to the trailhead in Elvedalen from this point. It took us around an hour to do this hike. 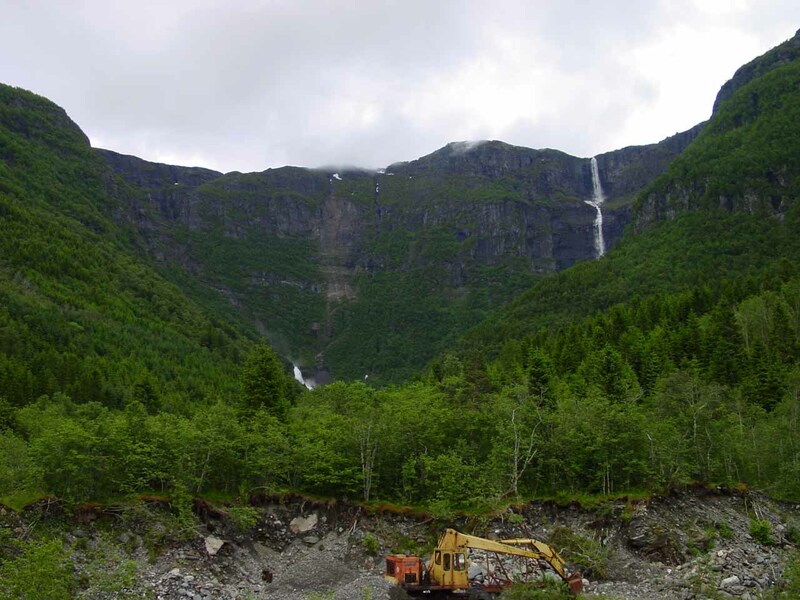 So based on this experience, I’m thinking that in order to get any decent glimpse of Opofossen (I recalled I saw one obscure partial photo from near its top), it would require a hike up one of the strenuous trails that would climb above Lofthus towards Hardangervidda. 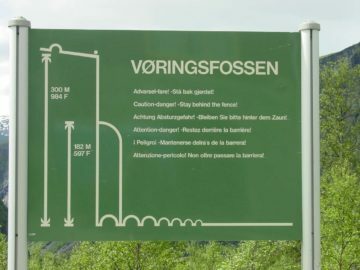 One such trail was said to contain the Monk Stairs or Munkestreppene. We weren’t about to try these trails during our late evening visit (we started at 9pm) so I personally can’t guarantee that it would yield a better view of it. 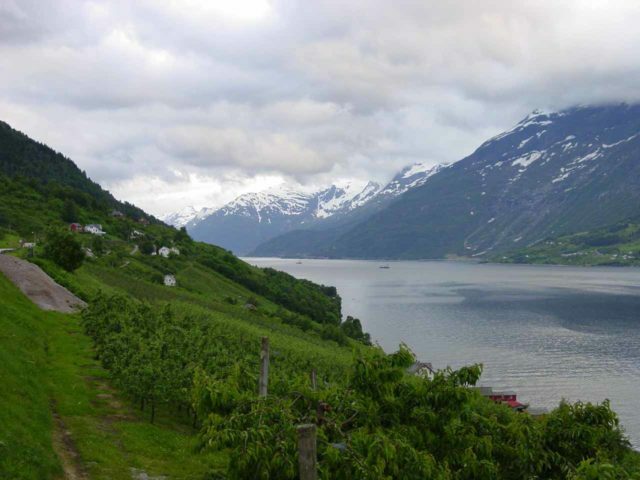 Besides, I’m on the fence about trying such a hike, but I’ll need to do more research before I decide to give it a go on a future Norway trip (if it happens). 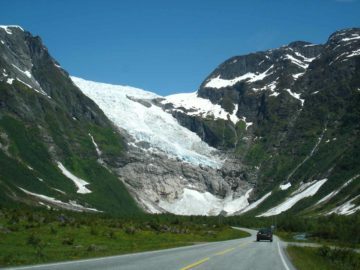 Skrikjofossen and Opofossen reside in the Ullensvang Municipality. For information or inquiries about the area as well as current conditions, visit their website or Facebook page. 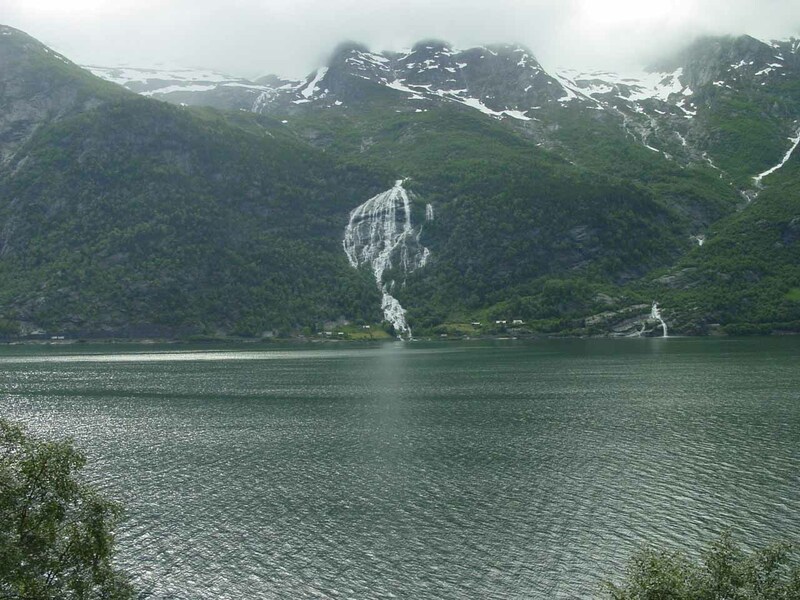 Lofthus was about 10km south of Kinsarvik or 32km north of Odda along the Rv13. 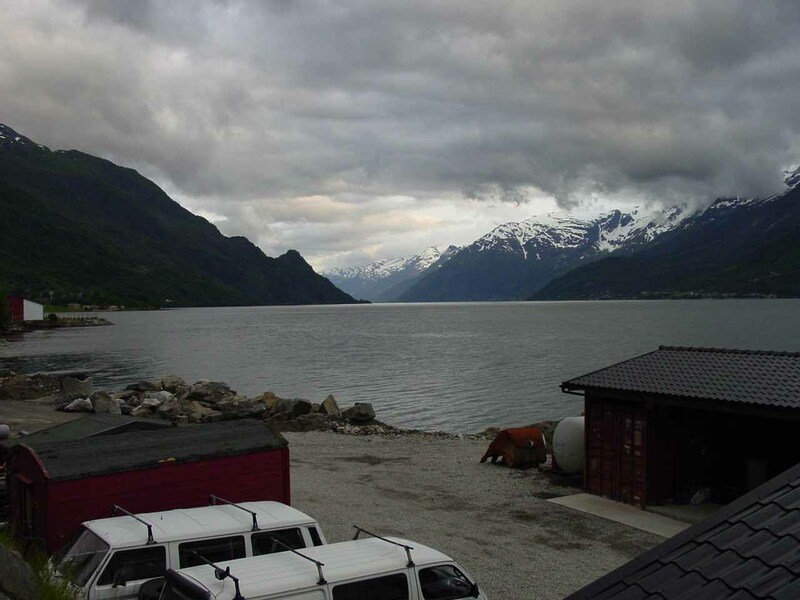 As for getting to the trailhead in Elvedalen, we took one of the obscure turnoffs south of the Hotel Ullensvang. From there, we had to drive through a maze of unpaved roads to get to its trailhead. 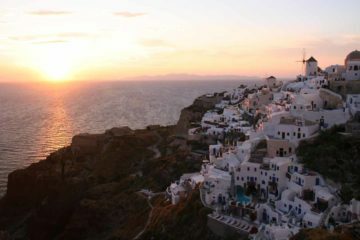 It was quite a challenge to us as we even had to ask around after getting lost several times (though we eventually found it). 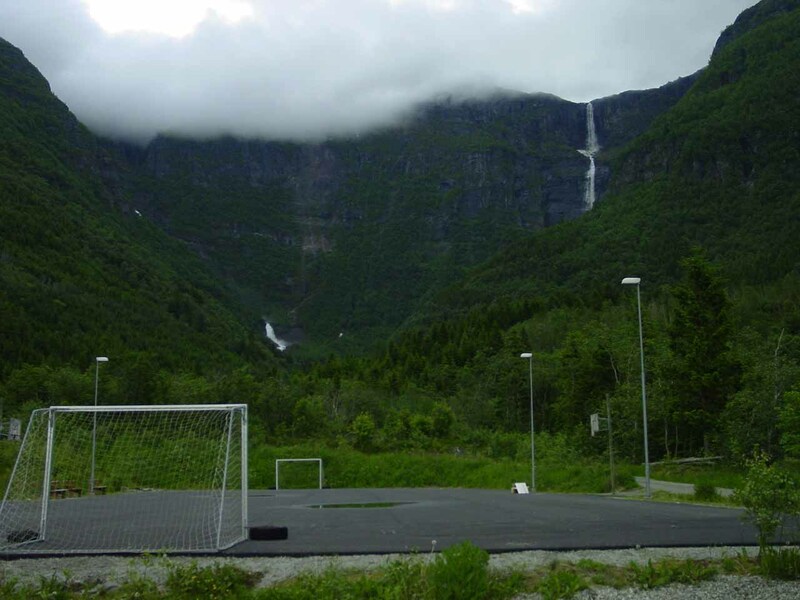 I recalled that there was a sign for “Elvedalen” and we ultimately reached the trailhead near some school and soccer field. For context, Odda is 134km (about 3 hours drive with a ferry crossing) east of Bergen. 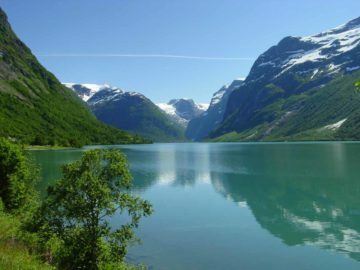 Odda is also 361km (over 5 hours drive) west of Oslo and 194km (over 3.5 hours drive with some ferry crossings) north of Stavanger. 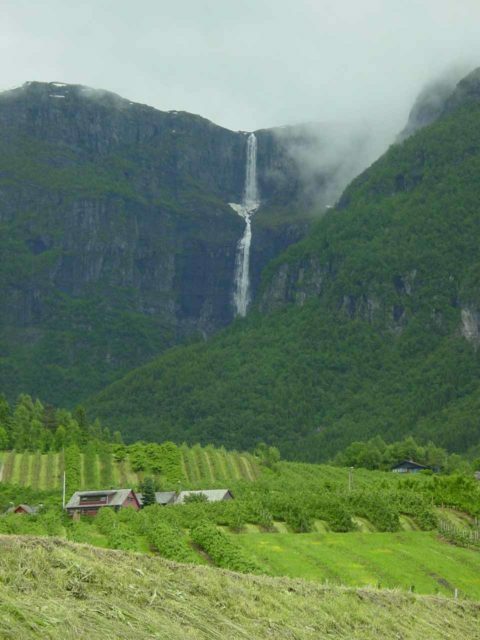 Eidfjord (roughly 30km or 30 minutes northeast of Kinsarvik) is about 310km (4.5 hours drive) west of Oslo.